Don't Break The Oath is best described as disjointed. 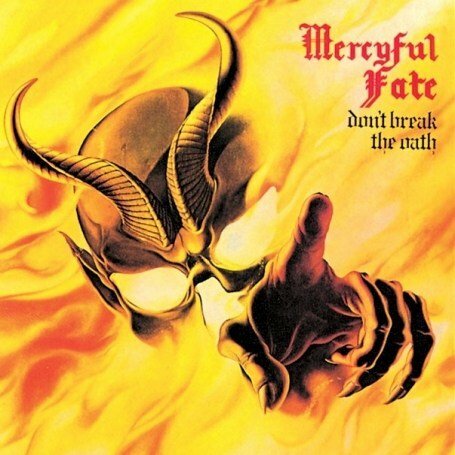 On their second studio album, Denmark's Mercyful Fate certainly create good sounding music segments; unfortunately, they rarely put them together into cohesive song structures. Other than the magnificent opener A Dangerous Meeting, most of the the tracks on Don't Break The Oath represent a poorly catalogued inventory of uncoordinated metal fragments. Each set of chords sounds great for 10 seconds before the next set takes over, with no logical extension from one set to the next and no strongly defined song structure. There is no disputing the band's dedication and passion for delivering relatively high speed, high energy metal that tries to sound dangerous, always with interesting attempts at tempo changes. King Diamond wails away in falsetto about his love for the devil, while Hank Sherman and Michael Denner are serviceable on guitar without ever blazing a clear trail through the noise. Gypsy and Come To The Sabbath hold together better than most of the other material, but overall, Don't Break The Oath is a cheap buffet with too much to eat, the good foods come in small portions, and the result is guaranteed indigestion. Engineered by Henrik Lund and Niels Erik Otto.